Puppies are born with no immunity at all. Their first milk feeds them what is called colostrum, which passes on some of their mothers. This is called passive immunity and protects them only for a time, therefore a vaccination schedule is vital to a puppies future health protection. There isn't a "hard and fast" or "one size fits all" vaccination rule book or schedule for dogs, hence the colour choice of this page, loads of grey areas. We will start puppies vaccinations at eight weeks, just before they go off to their new home, and although it would be our vets normal practice to then further vaccinate at twelve weeks, and then with annual boosters, the onus falls very much on your own vet to discuss and implement their preference of best practice. 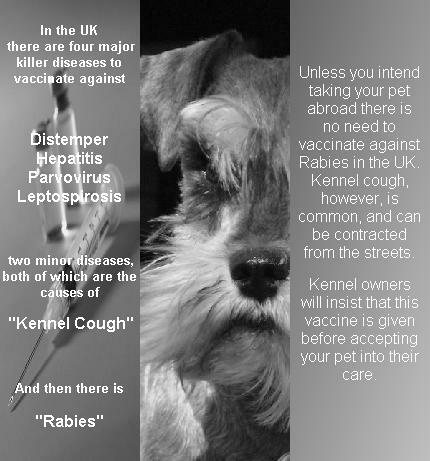 Your vet will be taking into consideration not only the guidelines of the manufacturer of their chosen product, but also any infectious disease risk within your local area.